Popular RidgeMont model with many upgrades, nicely landscaped and move-in condition. 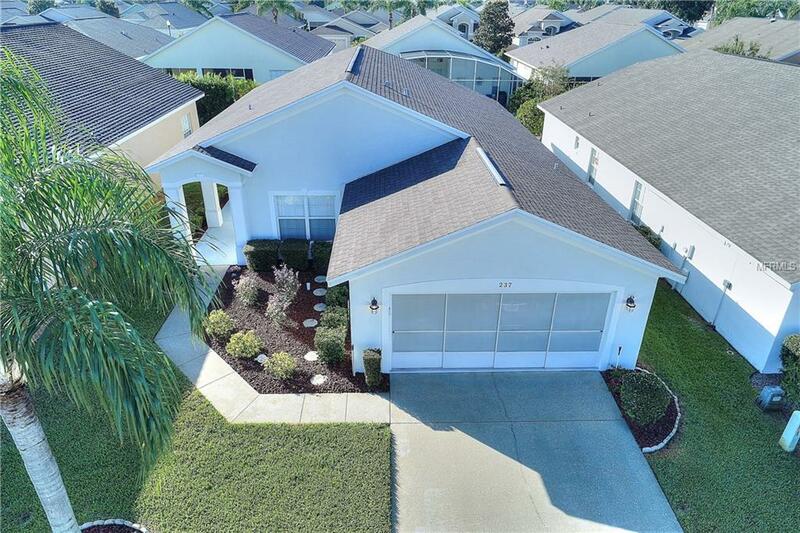 Direct access from garage to a large eat-in kitchen with quartz countertops, granite sink, under-cabinet lighting, Frigidaire Gallery stove & refrigerator (2015), updated dishwasher (2018). 10-12' vaulted ceiling in living room with coat closet and patio door access to an under-roof screened lanai. Tray ceiling in master bedroom. Large glass-block window over tub floods the master bath with natural light while offering privacy. Huge walk-in carpeted master closet is a favorite feature of this home. AC unit (2016) has UV lamp; air ducts were cleaned and sanitized. Exterior painted 2015. Laminate flooring 2014. Washer & dryer replaced 2012. Sliding screened garage door & pull down stairs to attic. Hot water heater on a timer. Microwave & kitchen radio reserved. High Vista is a 55+ community with a beautiful resident-owned private clubhouse, an outdoor heated pool & spa, fitness center, library, pub and a variety of organized activities. Tennis, pickleball, shuffleboard and bocce ball courts too. Miles of biking and walking trails within Ridgewood Lakes. Shopping, Disney, Universal, Orlando & Central FL entertainment nearby, easy access to I-4, medical facilities, airports and the new Sunrail Station. Heart of Florida hospital is less than 3 miles away.